The Garden City Scholarship Fund is pleased to announce a number of local businesses have eagerly agreed to sponsor our annual fundraiser featuring the Harlem Wizards basketball team. 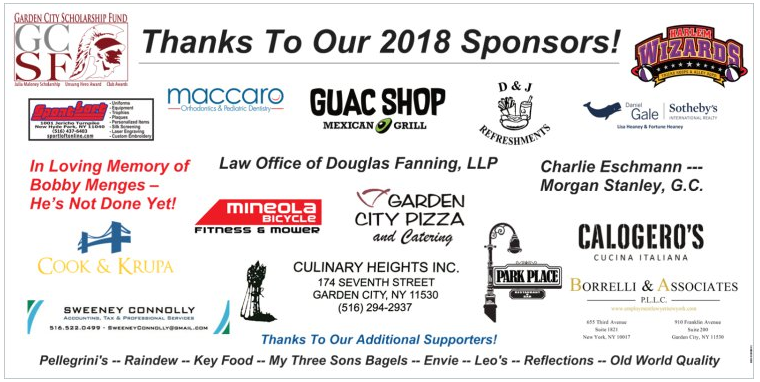 In addition, we extend our thanks to Envie, Key Food, Leo’s, My Three Sons Bagels, Pellegrini’s, Raindew, Reflections and Old World Quality Corp for their generous support. The funny and popular Harlem Wizards will take on members of the talented Garden City faculty in an entertaining basketball game on Saturday, February 3rd at 1 p.m. in the Garden City High School gym. Advanced tickets are available for $15 online (plus $.99 processing fee). If available, tickets will also be sold on Saturday, 2/3, at St. Paul’s from 8am – 9am and “at the door” at the high school for $20. Pre-order a Wizards jersey online to participate in the pregame warm-up with the Wizards at 12:30pm! Doors open at noon; souvenirs and refreshments will be on sale. Children 3 and under are free. This popular event is usually a sell-out so don’t wait! Proceeds from the event fund over $25,000 in annual grants awarded to deserving GCHS students, including the Julia Maloney Scholarship, The Unsung Hero Award and various Club Awards. The 2017 award winners included Mairead Pfaff (Julie Maloney Scholarship), Emma Wieland (Unsung Hero Winner), Marlee Rich (Unsung Hero Nominator), Natalie Abatemarco (Circle of Women), Kristen Andron (Fashion Club), Alessia Arianas (Italian Club), Zoe Caponegro (Latin Club), Ashley Colavito (MAST), Sophia Coyne (Italian Magazine), Meghan Creaven (Spanish Club), Christina DeGruccio (Miracle), Sophie Della Penna (Inkspots), Joseph Doud (FBLA), Brian Giarraputo (Sports Debate Club), Dario Hernandez-Arroyo (Science Olympiads), Caroline Kaczynski (Best Buddies), Georgii Litvinov (Mathletes), Hallie Mallozzi (Heart to Heart & ECHO), Richard Marooney (Peer AIDS), Camille Mojica (Masquers/A-V Club), Samantha Mozdzer (Latin Honor Society), Michael Nygaard (Italian Honor Society), Tyler Okada (French Honor Society), Alexis Pagonis (Spanish Honor Society), Suzanne Sanossian (Classic Movie Club), Shannon Sproul (Key Club) and Stephanie Tarian (Spanish Club).